A callshop is a public facility where end users come to make low-cost international calls. A customer is guided to an available phone booth (cabin) where he makes calls and pays for them at the cash desk afterwards. The callshop is managed by a callshop reseller who sets the tariffs by which the end users are charged. The callshop reseller usually employs one or more callshop operators. 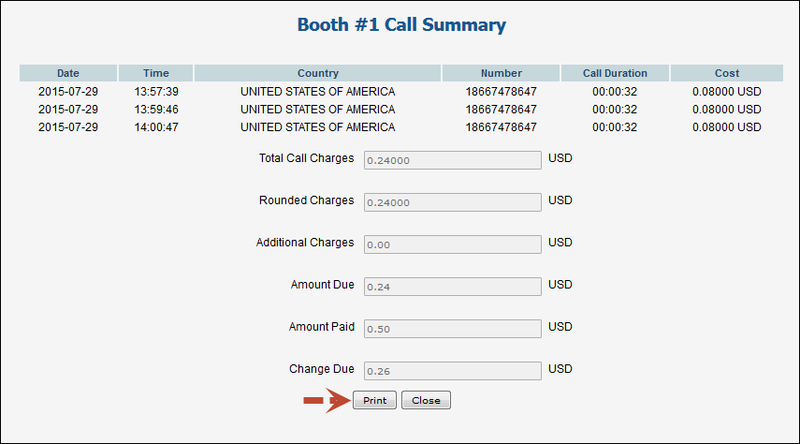 Callshop operators control the authorized use of the booths, collect payments and provide customers with receipts. 1. First, a customer is directed by a callshop operator to an available booth. 2. The callshop operator unlocks this booth to allow the customer to enter. 3. Once inside the booth, the customer dials the desired destination number(s). 4. When the call session ends, the customer leaves the booth. 5. The operator presents the customer with a receipt for the call(s) made. This handbook demonstrates how to configure a callshop reseller who provides callshop services to end users. In the example, the callshop reseller buys traffic from another reseller – for example, ABC Shuttle. The ABC Shuttle reseller, in turn, buys traffic directly from the ITSP but does not provide callshop services. Print the following page and use it to mark off the operations you have completed while performing the system setup according to the instructions in this section. Please make sure that you perform all of the operations in the order designated (all of the boxes should be checked), otherwise the service will not work. In this handbook, we assume that the ABC Shuttle reseller has already been configured by the administrator. For detailed instructions on how to configure a reseller in PortaSwitch®, please refer to the Configuring a Reseller for Postpaid Services or Configuring a Reseller for Prepaid Services handbooks. 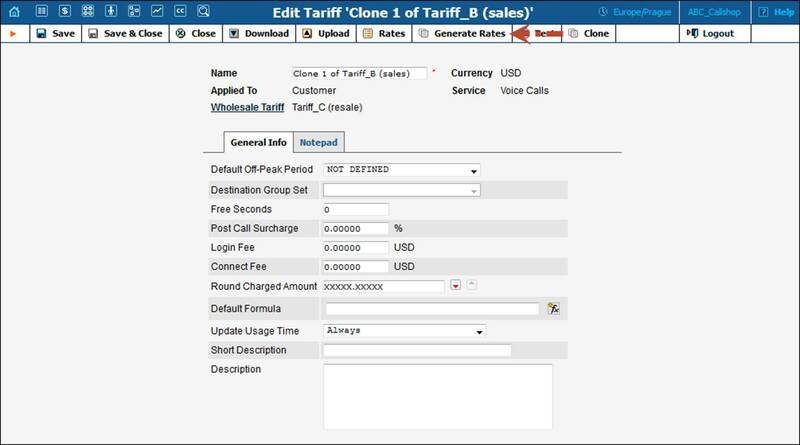 Since routing plan selection is not supported for callshop resellers, make sure to define only one rating entry containing the Voice Call service and one tariff in the product for callshop resellers. NOTE: Sometimes administrators try clicking the Logout button on the admin interface and then log in using a reseller’s username and password. This will not work since you are still in the admin realm, to which your reseller does not have access. You must log in from the reseller self-care interface. Bear in mind that callshop resellers can only provide callshop services to end users (no other services may be offered). 1. In the Participants section of the reseller self-care interface, select Callshop Resellers. 2. 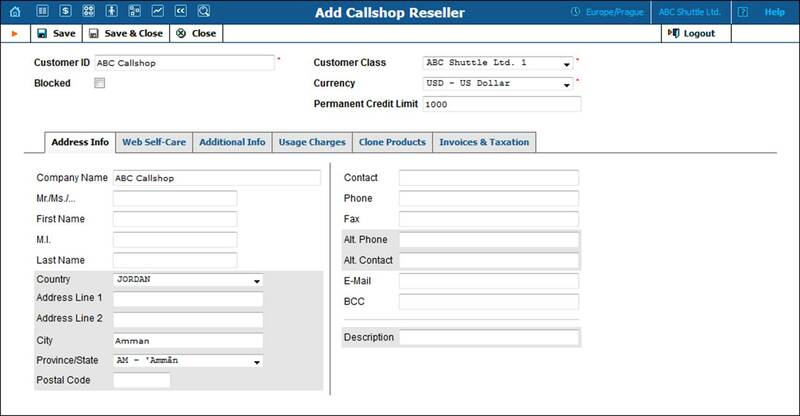 On the Callshop Reseller Management page, click the Add button. · Customer ID – Type a short name for the callshop reseller; this will be used on the web interface. · Customer Class – Select a customer class for this callshop reseller. A customer class is a set of various parameters which can be applied to a group of callshop resellers. By choosing a specific class here, the callshop reseller automatically inherits all of the class properties (grace period, invoice template, etc.). · Currency – Select the currency in which this callshop reseller will be charged. · Permanent Credit Limit – Assign a credit limit for the callshop reseller. Create the resale tariff and generate the resale tariff rates that the ABC Shuttle reseller will use for charging a callshop reseller for outgoing traffic. · Resale Tariff Description – Type the resale tariff description. When you are finished, click the Clone button. The product is the main instrument that defines which services a reseller can offer to their end users. To provide a callshop reseller with a product, the ABC Shuttle reseller clones one of his products. The cloned product becomes ‘at the disposal’ of the callshop reseller. 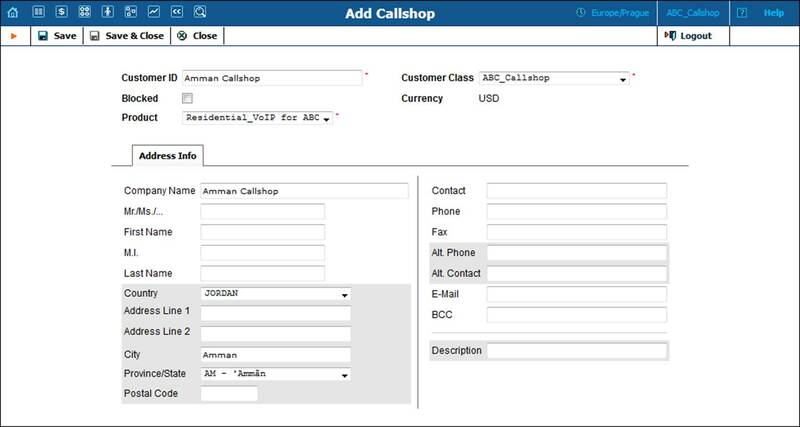 · Product Name – Type in a name for the callshop reseller’s product. Specify the credentials that the callshop reseller will use for accessing their self-care interface. · Login – Type the username that the callshop reseller will use for logging in to their self-care interface. · Password – Type the password that they will use. · Time Zone – Choose the time zone in which the callshop reseller will see their xDRs that will also define their billing period. For example, if you select America / Vancouver here and the billing period is Monthly, the billing period will start on the first day of the month at midnight (12 am) New York time. · Web Interface Language – Choose the language to be used on the callshop reseller self-care interface. Information on all other tabs is optional. A more detailed description of these tabs can be found in the Create a Reseller section of the Configuring a Reseller for Postpaid Services or Configuring a Reseller for Prepaid Services handbooks. Open the callshop reseller self-care page in a browser (by default https://<your-porta-billing-server-name>:8442) and log in with the credentials that were provided to you. The rate generation procedure by applying a percentage markup is described below in this section. 1. In the Rating section of the callshop reseller self-care interface, choose Tariffs. 2. 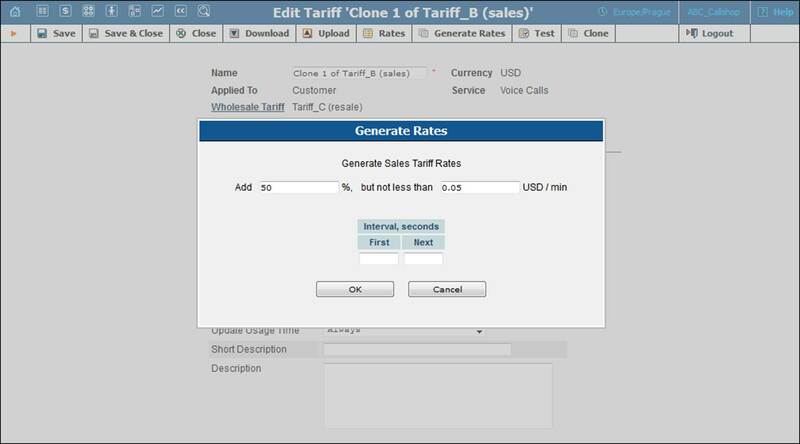 On the Tariff Management page, click on the sales tariff for which you want to generate rates. The Edit Tariff page opens. · Add – Type a percentage markup that will be applied to the wholesale tariff rates. · Interval First – Specify the first billing unit (in seconds) for the new rates. If this field is left empty, the value for the first billing unit will be taken from the wholesale tariff rates. · Interval Next – Specify the next billing unit (in seconds) for the new rates. If this field is left empty, the value for the next billing unit will be taken from the wholesale tariff rates. A callshop represents a public facility where customers can come to make low-cost international calls and pay for them afterwards. Each callshop reseller can have multiple callshops. 1. In the Participants section of the callshop reseller self-care interface, choose Callshops. 2. On the My Callshops page, click Add. · Customer ID – Short name for the callshop; this will be used on the web interface. · Customer Class – Select a customer class for this callshop. A customer class is a set of various parameters that can be applied to a group of callshops. The callshop will automatically inherit all of the class properties, such as currency rounding up rate, statistics generation, etc. · Blocked – Blocks all booths in this callshop (i.e. if this check box is checked, all booths in this callshop will become unusable). Leave this check-box unselected. · Product – Select a product for this callshop. · Currency – This field is read-only and displays the currency in which end users will be charged. The currency value is taken from the product assigned to this callshop. Other information fields in the New Callshop form are optional and do not need to be specified during callshop creation. Now you can create booths for your callshop. 2. On the My Callshops page, click the Booth icon next to the callshop for which you want to generate booths. 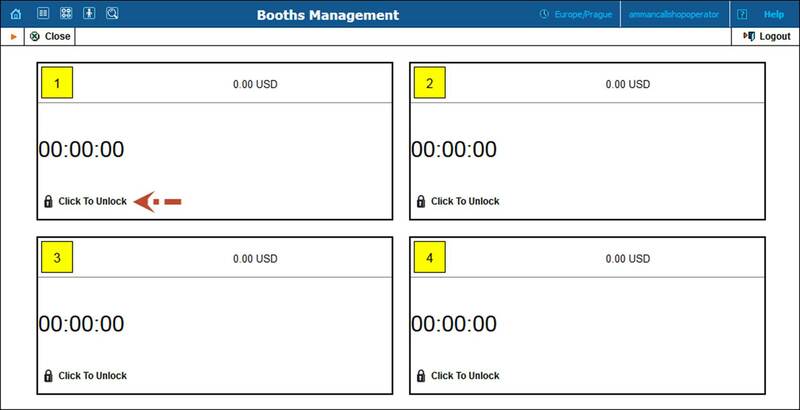 The Booths Management page opens. 3. On the Booths Management page, click Generate. The Generate Booths dialog box opens. 4. In the Generate Booths dialog box, enter the number of booths to be used in this callshop. Callshop operators are the personnel who operate callshops and perform such duties as: control the authorized use of booths, collect payments from customers and provide customers with receipts. 1. In the CC Staff section of the callshop reseller self-care interface, choose Callshop Operators. The Operator Management page opens. 2. On the Operator Management page, click Add. · Callshop – Select a callshop that the callshop operator will operate. · Login – Type the username that the callshop operator will use to log in to their self-care interface. · Password – Type the password that the callshop operator will use to log in to their self-care interface. · Time Zone – Specify the time zone in which the callshop operator will see the xDRs. · Web Interface Language – Select the language to be used on the callshop operator self-care interface. Now your callshop is configured and ready to operate. The guidelines on how to operate a callshop are outlined in the sections below. To quickly respond to shifting market demands, callshop resellers can easily adapt their sales rates by changing products in their callshops. Once a new product is chosen, this new product is assigned to all booths in this callshop. 1. On the Edit Callshop page, open the Product drop down list. 2. Choose the desired product from the list and click Save&Close. Open the callshop operator self-care page in a browser (by default https://<your-porta-billing-server-name>:8446) and log in with the credentials that were provided to you. A customer comes to the callshop to make calls. Unlock a booth for him / her. 1. In the Participants section of the callshop operator self-care interface, choose Booths. The Booths Management page opens. 2. 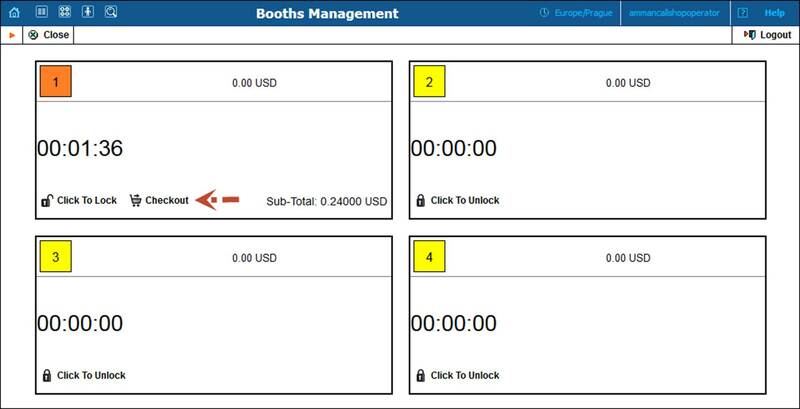 On the Booths Management page, choose a free booth and click the Click to Unlock icon to unlock the booth. The customer can then make calls to desired destinations. 3. Once the customer leaves the booth, to prevent unauthorized use of the booth, click the Click to Lock icon to lock it. Present the customer with the receipt for the call(s) made in the booth. 1. On the Booths Management page, click the Checkout icon for the booth from which the calls were made. The Booth Call Summary dialog box opens. 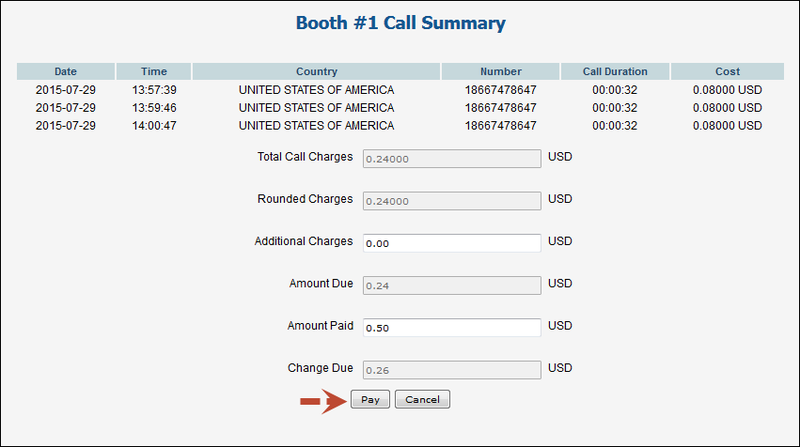 · Total Call Charges – This shows the total charges for the calls made from the booth. · Rounded Charges – This shows the total charges rounded up to the value specified for this callshop. For example, setting the rounding up value to 0.05 will round up 1.26 to 1.30; setting it to 1.00 will round up 1.26 to 2.00. · Additional Charges – This presents additional charges a callshop operator may add to the customer’s bill (such as internet usage or a cup of coffee). · Amount Due – This shows the total amount the customer must pay. · Amount Paid – This shows the amount paid by the customer. · Change Due – This calculates the change the operator returns to the customer. 3. Click the Pay button to submit the payment information and then click the Print button to print the receipt. 4. Collect payments from the customer, return change and provide him / her with a receipt.